"How are the Road Trains treating you?" is the question asked of anyone who's ever cycled the highways of Northern Australia. It is usually asked by a grey haired caravan hauler, who is quite rightly intimidated by these monsters of the road. So what exactly is a Road Train? Everyone is familiar with the standard truck and the standard semi-trailer we encouter on our roads. Configurations such as B-Doubles (a semi with an articulated trailer), Truck with full trailer or even B-Triple (a semi with a trailer articulated in two additional places) may look and be as big as trains but these are merely "Long Vehicles". A "Road Train" is a long vehicle with at least one, but more often two additional trailers attached at the rear. In the eastern and southern states road trains are banned from most roads. Two trailer combinations can be found throughout most of rural Western Australia, across the Nullarbor and in some parts of NSW, Victoria and Queensland. However the serious three trailer rigs ply the Stuart Highway from Port Augusta to Darwin, and across the top from Western Queensland as far as Geraldton in WA. As you might expect, these huge vehicles pose a special threat to cyclists. They are big, heavy, and nowhere near as nimble as a regular semi-trailer. About as easy to handle as a bicycle towing 6 BOB trailers I imagine. Road trains cannot easily slow down or safely maneuver in any direction terribly quickly, so expecting one to do so is asking for trouble. When it is safe to do so, a road train driver will always pull his rig completely into the oncoming traffic lane to overtake a cyclist, well before he passes. When it isn't safe the truckie will let you know with blast of his horn. This is simultaneously a polite request that you make way for a very large and difficult to handle vehicle, and a subtle warning that if you don't your flattened remains will decorate the highway surface for years to come. Give the drivers a wave. Driving road trains is a lonely boring job with some serious responsibilities and these guys usually appreciate the occasional bit of human contact. Keep your eyes open and get off the road if you sense potential problems, like a roadtrain behind being overtaken, oncoming traffic, poor visibility etc. If a roadtrain driver blasts his horn to ask you to get off the road, GET OFF THE ROAD !! Once off the road, wait until the all of the road train has passed before getting back on the road. This might be obvious but believe it or not a cyclist was killed on the Stuart Highway a couple of years ago after vacating the road for a truck, only to try to get back on after the second trailer passed to be collected by the third trailer. 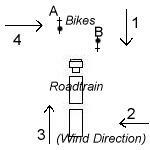 The effects of a passing road train on a cyclist depend on the wind direction. If it's from the left, then you'll hardly notice it. If it's blowing from the right then even if the road train misses you when you're collected by it's wake it'll feel about the same. You also need to watch you don't get dragged into the rear trailer by the considerable vortex generated by an overtaking road train. If the wind is from the front there is a danger you won’t hear a road train coming up from behind. Keep an eye out, but feel free to enjoy the few seconds of draft after the train has overtaken. With headwinds an oncoming train will slow you down even more. Issue profanity. And finally, when the wind is at your tail you can enjoy going from 40kph to 14kph in 2 seconds. Drafting cyclists take note. Stuart Highway north of Alice Springs, especially on the day after the twice weekly rail train from Adelaide arrives. Also checkout the photo collection in the Dunmarra Roadhouse. West of Derby on the Great Northern Highway in WA (more double B-Triple ore haulers). In the Tanami Desert in NT, where there is now a 400 tonne seven (yes seven) trailer two engine road train servicing "the Granites" gold mining project. I can't wait to for that one to pass me. So how do the road trains treat me? Very very well. The rule of thumb is: the bigger the rig, the more responsibly it's driven. I'd much rather be overtaken by a road train than a semi, as I know the road train driver is far more likely to do the right thing by everyone. I’d certainly rather be overtaken by one road train than three semis. So next time you see a road train, give the driver a wave and be grateful there are two less trucks on the road as a result. Even if the road train misses you when you're collected by it's wake it'll feel about the same. Watch you don't get dragged into the rear trailer by the considerable vortex generated by an overtaking road train. There is a danger you won’t hear a road train coming up from behind. Keep an eye out, but feel free to enjoy the few seconds of draft after the train has overtaken. With headwinds an oncoming train will slow you down even more. Issue profanity. Enjoy going from 40kph to 14kph in 2 seconds. Drafting cyclists take note.